So, January is half over?! I took a slight break from updating during the holidays, but I am back and ready to be creative. It’s 2010, we just moved into our first house, and I’ve got a slew of projects in the que! Just like Grandma used to make! Make a chain of like 30, single crochet down the chain, on the last chain crochet three times. Keep crocheting, and when you hit the other end, crochet three on the last chain. Keep going around the circle. 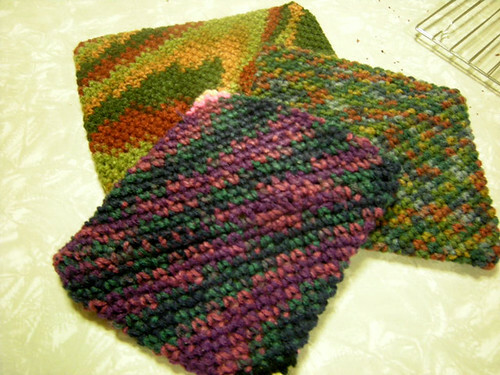 Fold the crocheted goodness so you have two points, keep crocheting until the two sides meet. Connect the sides. Take hot items out of the oven. Enjoy. I really haven't been slacking! 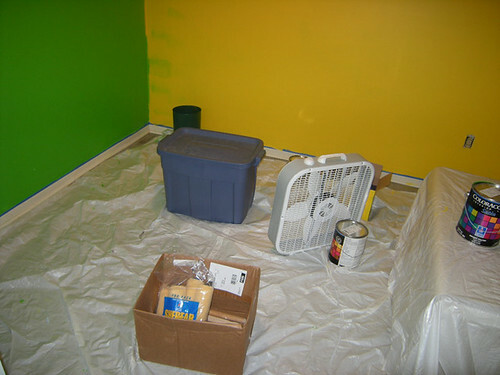 Two walls painted, still need to do the last one. Please ignore the shotty corner job. Will be fixed once I get some more tape. And today, drumroll please, I baked for the first time in my new kitchen! 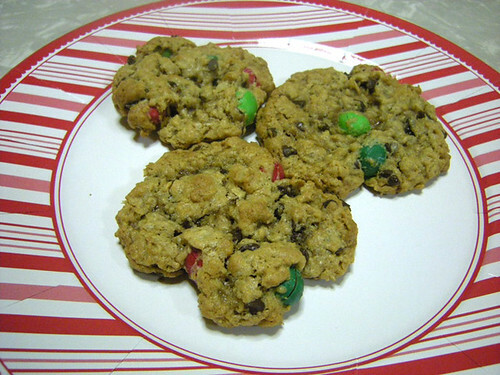 Dessert of choice: Monster Cookies! This particular recipe comes from the Immanuel Lutheran Church of Waukee, circa 2006. Cream sugars and butter, add eggs, soda, syrup and peanut butter (I just realized I forgot last half cup of peanut butter, still turned out fine, also explains why they aren’t as peanut buttery as usual). Get this all creamy – then add your oatmeal. Once you get the oatmeal mixed, add your chocolate chips and M&Ms. Scoop on to the pan, try to flatten, and bake at 350 for 10-12 minutes. 350 for 10-12 is what the recipe said. I pushed mine back to about 300, and had to have them in for about 13-14 minutes. I’m still getting used to my oven.